David Park is entering his senior year at Monarch High School this fall, and is also on the verge of receiving his Eagle Scout Rank through the Boy Scouts of America. To achieve this rank, every Scout must complete a service project, and David chose to partner with Imagine! for his project. Imagine! provided Gina and her family a platform, and in turn, David literally provided Imagine! a platform by way of a refurbished second level deck at the Boulder CORE/Labor Source (CLS) site. After several meetings and a year of collaboration, David felt this was his best way of giving back. “My Scout Master suggested that this project would be too big and he recommended I pick something else. 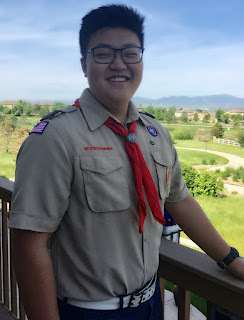 But I saw how badly it needed repair and felt that it would have the biggest impact on services at Imagine!.” David recruited a total of 20 boy scouts and parents to help out. “It was a labor of love on David’s part,” said Jeff Rodarti, CLS Coordinator. David and his crew stripped the old and rusted baseboards and fencing, then CLS staff members gutted the mud and junk that was resting underneath the boards. The next three weekends involved all the construction and assembly. One weekend, David and his dad built and installed the railing on their own. After four full weekends of hard work, David and his volunteers finished a job that was predicted to be too big of a task. David and Jeff Rodarti were determined to see this project through, putting in countless hours of preparation and labor. “We are very grateful to David for his time and effort,” said Rodarti. “Not only was the old deck an eyesore, but it was slowly becoming a safety risk.” The counselors have already taken advantage of the new space, using it to complete documentation or make phone calls. The coordinators plan to schedule staff development activities on the new deck as well. "If feels great to see the project finished," said David. "I learned how to be more flexible and that not everything will work out as planned." David has only a few merit badges to go before receiving his Eagle Scout Rank. "The hard part is over." The endless hours of planning and constructing are in the books, and Imagine! is grateful for his service.